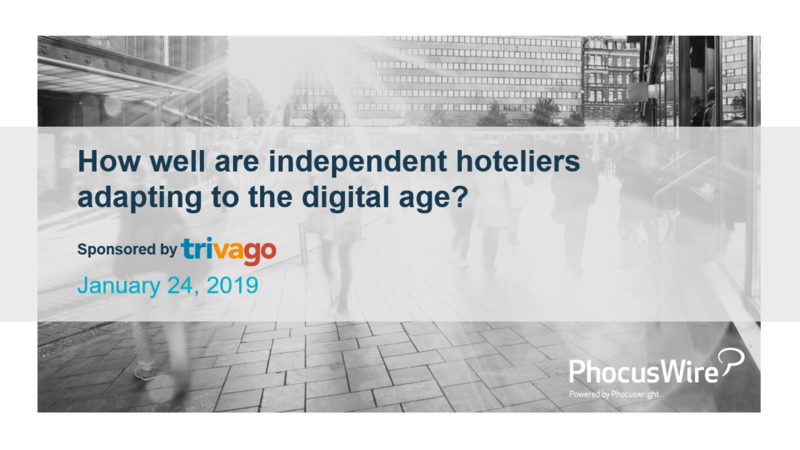 The latest joint webinar from trivago and Phocuswright explored the status of independent properties in the online marketplace — their business practices, tech usage, greatest challenges and roadblocks, and most promising opportunities. Webinar attendees also received additional, equally crucial insights into how independent properties can improve their competitiveness online and reduce their OTA dependence. Those who missed the live event still have a chance to watch the full webinar recording. Overall, independent properties invest less than 2% of their revenue in online marketing activities. According to Jessica Neth, the expert panelist from trivago, working with such limited budgets presents significant challenges for independent properties, who are struggling to compete with the bigger players. Research presented in the webinar showed that nearly 90% of independent property owners and managers plan to maintain or increase their use of metasearch for visibility and bookings in the future. While the panelists all agreed that technology is fundamental to an independent property’s success in the digital age, they also discussed the critical barriers preventing hoteliers from accessing it. They went on to provide tips on how independent lodging providers can identify the best solutions for their properties, and which core pieces of technology they should start. Watch the full video recording of the webinar at PhocusWire to get all the insights.